Amid the flare-up in the Gaza Strip, Hamas says Palestinian resistance groups have agreed to a ceasefire in the blockaded coastal sliver as long as Zionist regime abides by a truce. “After the resistance succeeded in confronting the [Israeli] aggression … there was a lot of mediation in the past hours,” Khalil al-Hayya, Hamas’ Deputy Chief in Gaza, said in a statement on Wednesday. “An agreement was reached to return to the (2014) ceasefire understandings in the Gaza Strip. The resistance factions will abide by it as long as the Occupation does the same,” he added. Zionist regime’s tank fire and airstrikes hit Gaza on Tuesday. The Tel Aviv regime said its assault came in response to a barrage of rocket and mortar rounds fired at the Occupied Territories. 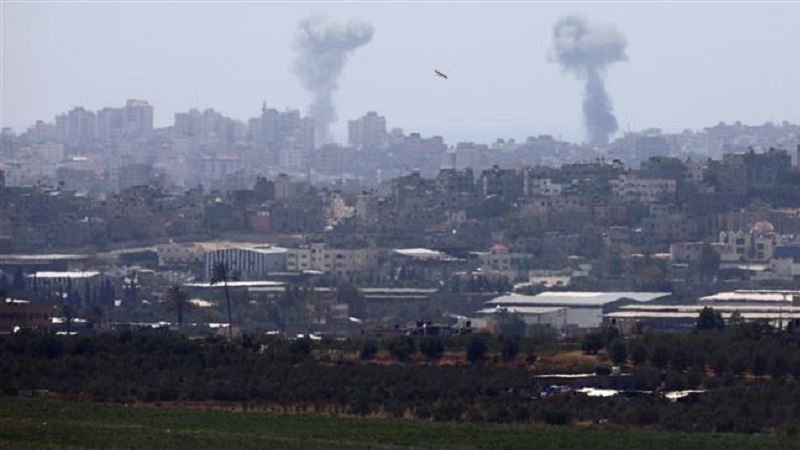 The military wings of Hamas and the Palestinian Islamic Jihad claimed “responsibility for the striking of military positions and Zionist settlements,” saying their strikes were in response to Israeli attacks targeting their positions in recent days. They said in a joint statement that Israeli “crimes cannot be tolerated,” warning that “all options will be open” to them. “All factions, including Hamas and Jihad, are committed to understandings for calm,” he noted. However, Zionist regime’s Spy Minister Yisrael Katz sidestepped questions on a Gaza truce, but stressed that Tel Aviv was not interested in an escalation toward war. “It all depends on Hamas. If it continues (to attack), I don’t know what its fate will be,” he said on Israel Radio. Tensions have been running high along the Gaza fence since March 30, which marked the start of a series of protests, dubbed “The Great March of Return,” demanding the right to return for those driven out of their homeland. The Gaza clashes reached their peak on May 14, the eve of the 70th anniversary of the Nakba Day (the Day of Catastrophe), which coincided this year with the US embassy relocation from Tel Aviv to occupied al-Quds. At least 65 Palestinians were martyred and more than 2,700 others wounded as the Israeli forces used snipers, airstrikes, tank fire and tear gas to target the Gaza demonstrators on May 14. Zionist regime conducts regular air raids on Palestinians in Gaza under the pretext of hitting Hamas targets. The Gaza Strip has also been under an inhumane Israeli siege since 2007.